Flawford Church lies in Nottinghamshire south of Nottingham and 1½ miles east of the village of Ruddington at an ancient crossroads from which it is reached by Flawforth Lane. It is situated in an area of flat farmland which rises gently in the distance. From the northern boundary of the churchyard the ground slopes away to form a gentle escarpment. The sub-soil is Keuper Marl with bands of Lias which comes close to the surface. The Lias is a period of Geological time towards the end of the Early Jurassic that is from around 195,000,000 years ago until 180,000,000 years ago. It is an area that is particularly well drained and favourable for cultivation. Flawford Church lies in what was an important crossroads. At the entrance to the churchyard the road form Ruddington turns sharply north to join the South Nottingham Ring Road at the Lings Bar traffic island. there is evidence from early maps anmd from indications on the ground that the road from Flawford to Rudidngton and to Edwalton once formed two branches of a croosroads. 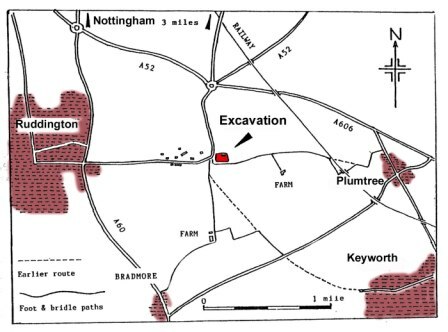 The two missing branches ran eastwards to Plumtree and southwards to Keyworth. The roads lead east to west from Ruddington past Flawford to the village of Plumtree. There was also another north – south road from Edwalton, now a suburb of Nottingham through to Keyworth village. Flawford was therefore lying in a central position as the mother church for the four villages. The road system has been altered over time and Flawforth road runs from Ruddington and takes a right angle to turn north at the ancient site to travel towards Edwalton. The Plumtree road still survives as a bridle path and the Keyworth branch can be seen as a farm road and footpath as far as Blackcliffe Hill from which point there is a gap of about half a mile. The Keyworth end is still recognisable leading out of the village. It is likely that through lack of usage resulting in from the neglect and eventual demolition of the church, the roads became unrecognisable. Lawson Lowe in 1874 wrote that the Plumtree road was an " ...ancient causeway paved with stones and disused since the church was destroyed, (and) can only be traced when the corn along its track bear a half blighted aspect and the grass prematurely ripens."